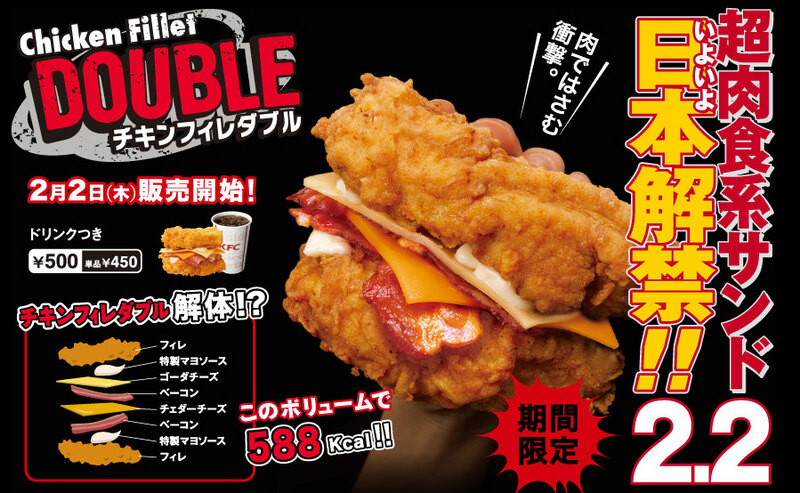 Starting yesterday (2012 February 2), Kentucky Fried Chicken restaurants across Japan have begun selling their new 「チキンフィレダブル」 (“Chicken Fillet Double“). This unusual “sandwich” has no bread. In it’s place, there are two chicken fillets and between them is two pieces of bacon, two slices of cheese, and two dallops of mayonnaise. 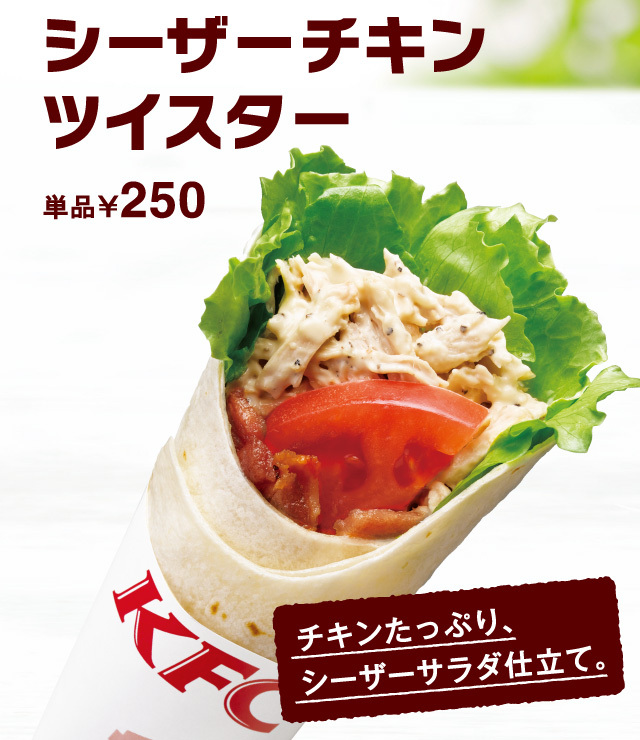 You can get the 「チキンフィレダブル」 (“Chicken Fillet Double“) with a drink at Kentucky Fried Chicken in Japan for the price of ¥500 (US$6.57). On a side note, today (February 3) is the Japanese holiday 「節分」 (“Setsubun”). September 9th is the birthday of the late Colonel Harland Sanders, the founder of the American fast-food chain Kentucky Fried Chicken. 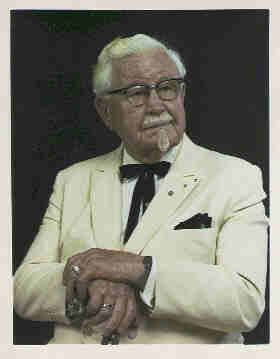 カーネル・サンダーズ (Colonel Sanders) died in 1980 at the age of ninety. But if he were still alive, he would turn 121 this Friday. Colonel Sanders and his Kentucky Fried Chicken restaurants are popular in Japan…especially at Christmastime. Many KFC restaurants in Japan have life-sized statues of Col. Sanders out front. Most Japanese people think, though, that Colonel Sanders first name is actually 「カーネル」 (Colonel). They have no idea that his name is actually Harland Sanders and “colonel” is a rank in the military (the Japanese equivalent is 「大佐」). And, also, Kentucky Fried Chicken is often shortened to “KFC” in America…but in Japan, it’s normally called 「ケンタッキー」 (“Kentucky“) for short. Click here to read the post I wrote last year about the 40th anniversary of KFC in Japan. That post also has links to other posts I wrote that tell about the popularity of KFC at X-mas in Japan and also about the “Curse of the Colonel“ in Japanese baseball. Anyways, to celebrate Colonel Sanders’ birthday, Kentucky Fried Chicken in Japan is offering a set called the 「カーネル・バースデー・パック」　(“Colonel Birthday Pack”), which has three “Original Chicken” and three “Colonel Crispy” chicken, for ¥990 until 2011 September 21st. The special price of ¥990 was chosen for this campaign because Colonel Sanders birthday is the ninth day of the ninth month (September 9th). The Kentucky Fried Chicken fast-food chain started their operation in Japan in 1970. So this year is Kentucky Fried Chicken, Japan‘s 40th anniversary. They are offering some specials to commemorate the occasion. When I was growing up in America, I didn’t really like Kentucky Fried Chicken. It had an image of being greasy, inferior fast-food. But Kentucky Fried Chicken (or simply “Kentucky“, as it’s often referred to in Japan) is popular in Japan. For good reason…their food and service is much better in Japan than it is in America. 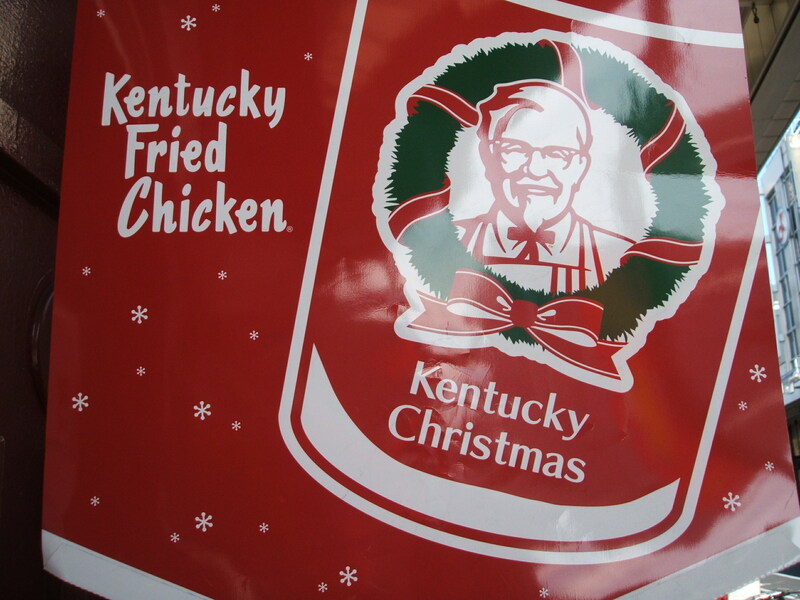 At Christmas-time in Japan, it is popular to eat Kentucky Fried Chicken. 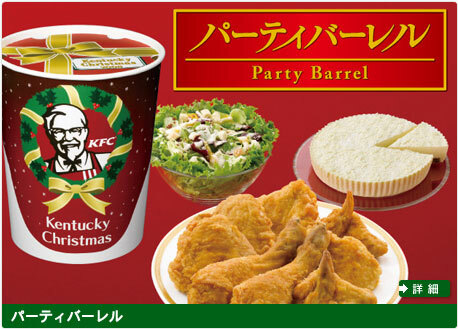 (Click here to read a post I wrote about X-mas in Japan…including photos of KFC‘s X-mas set-meal. and 「レッドホットチキン」 (“Red Hot Chicken“). How is Kentucky Fried Chicken where you live? Do you like Kentucky Fried Chicken? Have you tried it in Japan? How does it compare to KFC in your country? Today is X-mas. So, “Merry Christmas“. In Japan, people often eat Kentucky Fried Chicken for their X-mas dinner. Anyways, as I’ve mentioned before, X-mas isn’t even a legal holiday in Japan. But, New Years is Japan’s biggest holiday. And of Japan’s numerous music TV shows, the one that airs on New Years Eve is the biggest. It’s called 「紅白歌合戦」 (“Red and White Music Battle“). It’s a four and a half hour music special and ends in a countdown at midnight on New Years Eve. Artists who are invited to appear on this show are considered the hottest acts in Japan because of the importance of this show in an artist’s career in Japan. A number of foreign artists have appeared on this show over the years. Namely, Cyndi Lauper, Paul Simon, and Sarah Brightman, among others. 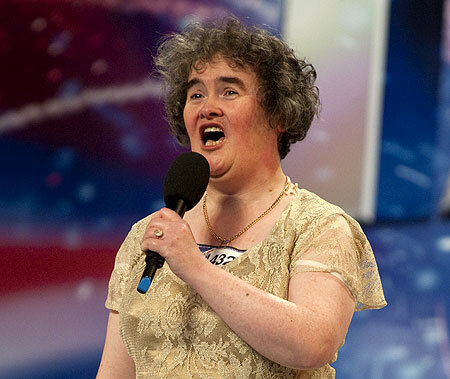 This year, the English singer Susan Boyle is scheduled to perform live on the show. 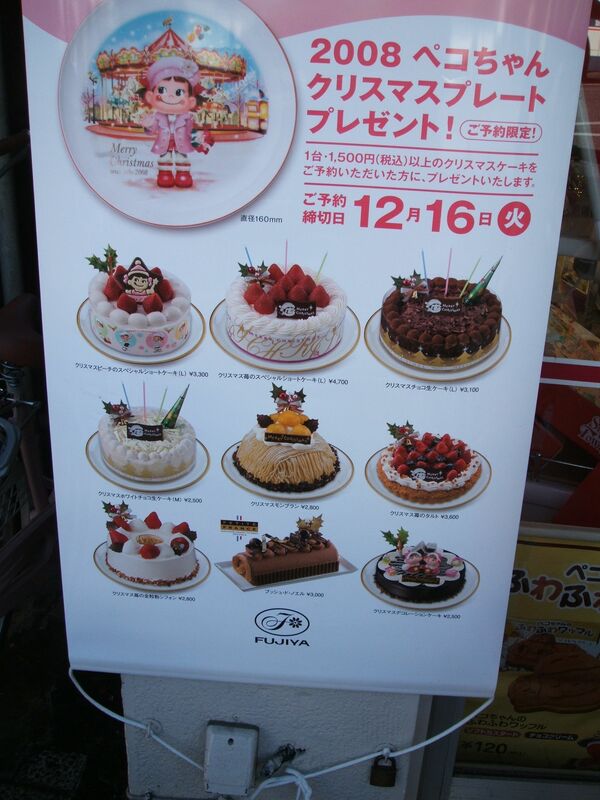 Many overseas companies want to open shops in Japan. The Japanese market is very lucrative…for companies that prove to be popular here. But the Japanese consumer is very finicky. Companies that don’t meet Japanese expectations are doomed to fail. For example, the American donut company, Dunkin’ Donuts, is popular in America. But when they opened stores in Japan, the Japanese people found their donuts too sweet…and Dunkin’ Donuts was unable to stay in Japan. On the other hand, the less-sweet American donut chain Mister Donuts is very popular in Japan. (Ironically, Mister Donuts isn’t very popular in America). 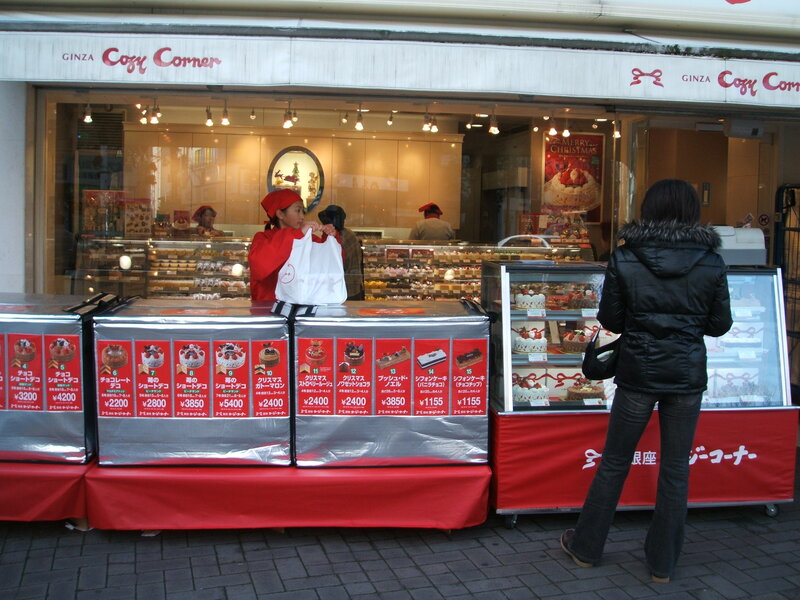 Krispy Kreme Donuts set up shops in Tokyo recently, too. 7-Eleven (and other convenience stores) are very popular in Japan. Japan is a small country, but there are almost twice as many 7-Eleven stores here than in all of the U.S., Canada, and Mexico combined! Convenience stores in Japan are very different from their counterparts in America. Japanese convenience stores are great! 7 & i Holdings, the Japanese company that owns 7-Eleven also owns the restaurant chain Denny’s. Denny’s in Japan have a different menu than Denny’s in America. I like Denny’s Japan better (but that may be because I’ve been in Japan for awhile now, and I’m more used to Japanese style food). 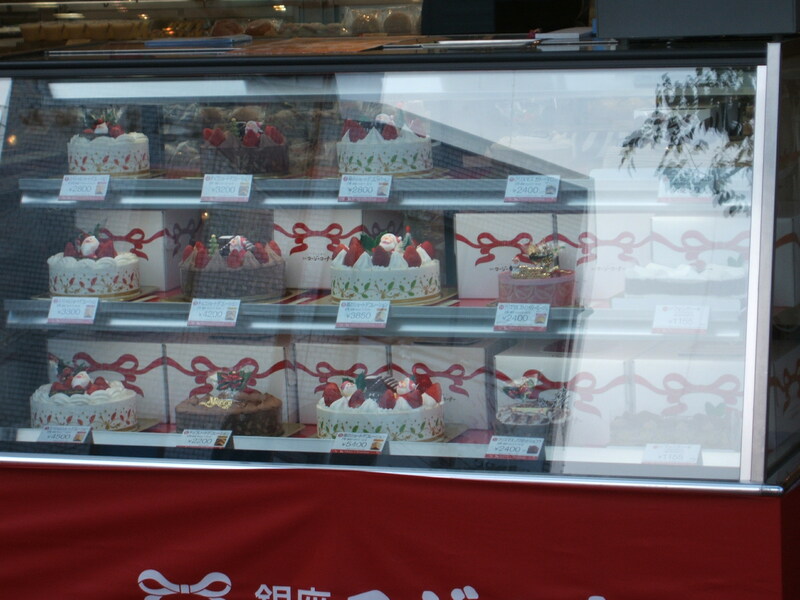 The American bakery Vie de France is in Japan, too. But it’s not American anymore either…Yamazaki Bread owns this company. I like Vie de France. Their bread is excellent. I have wrote a post about Domino’s Pizza in Japan. Click here to see it. I like Subway sandwich shop, alot. The Japanese Subway sandwich shop. The menu is much better at Subway Japan than the U.S. branches. There are Japanese fast-food restaurants, too. These include MOS Burger, First Kitchen, and Freshness Burger (which has beer on the menu! 🙂 ). Occasionally you can still find a Dom-Dom Burger, and there used to be a chain called Love Hamburger. Love Hamburger went out-of -business about 12 years ago and the U.S. chain Burger King bought all of the Love Burger shops and opened Burger King in Japan in the late ’90s…but they made the ill-fated decision to offer only a limited menu to test the Japanese market. That didn’t go over well and soon they went out-of-business in Japan, too. 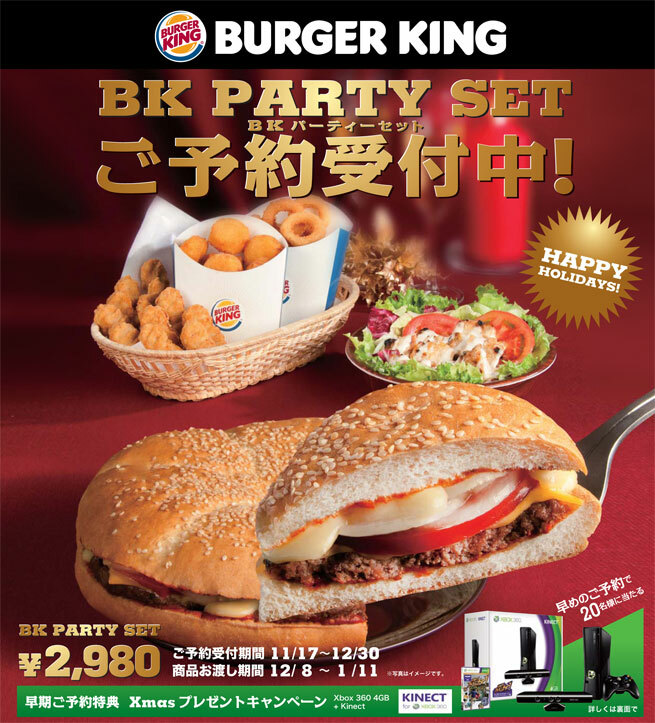 But recently, Burger King decided to re-try the Japanese market…and I guess they learned from their past mistakes—they seem to be doing well in Japan now. There are also branches of Sizzler, Outback, and Tony Romas in Japan. There are other foreign companies here, too…but you get the idea. All of these foreign companies have to keep on their toes and provide the service and products that the Japanese expect…and for each of these foreign stores in Japan, there are Japanese companies that provide similar products that they have to compete with. But if the effort is worth it…Japan is the most profitable market for most of these companies. Anyways, today is Valentine’s Day. (Click here to read a post I wrote about Valentines Day in Japan). It’s Christmas time…and Xmas is celebrated in Japan, but not to the extent that it is in Western countries. In Japan, New Years is the biggest holiday. Actually, Xmas isn’t a legal holiday here…I mean, it’s a work day (unless it falls on the weekend). In Japan, クリスマス (Christmas) is mainly for couples and families with children. Couples often go on a date to look and クリスマス・イルミネーション (Xmas illumination). (Click here to visit a website that shows many places around Japan to see クリスマス・イルミネーション (Xmas illumination). (That site’s in 日本語 (Japanese) only)). And they may also go to 東京ディズニーリゾート (Tokyo Disneyland or Tokyo DisneySea) for the Disney Christmas event that they have there (of course, this is less popular with couples who aren’t in the Tokyo area). Families with children may also go to 東京ディズニーリゾート (Tokyo Disneyland or Tokyo DisneySea), if they’re in this area. But in Japan, most homes aren’t decorated for Xmas…especially uncommon are Christmas trees. Stores and shopping malls, on the other hand, are very decorated for Christmas from November until Xmas day (after that, the decorations quickly change to the more important New Years decorations). In Japan, Santa Clause will leave presents near the pillows of young children in Japan on Christmas Eve. On average, Japanese children receive fewer Xmas presents than children in Western countries. On Christmas Day, it’s popular for families to have a Christmas dinner. But it’s different from Xmas dinners in other countries. When Japanese people think of Christmas dinner, most think of Kentucky Fried Chicken® and a strawberry poundcake that is called クリスマス・ケーキ (Christmas cake). Kentucky Fried Chicken® started a campaign about thirty years ago at Christmastime by decorating their shops for the holiday and offering set meals advertised as American style Christmas dinners. 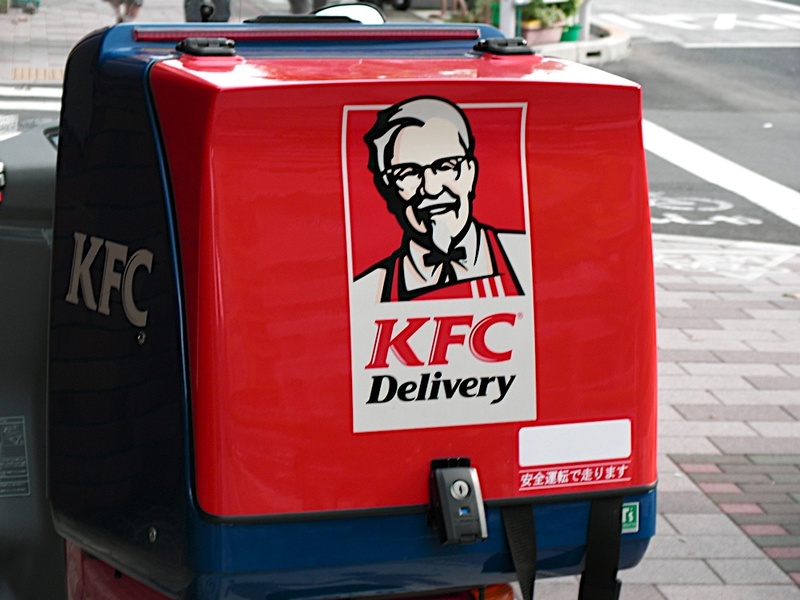 And now, on Christmas Day, Kentucky Fried Chicken® always has long lines outside their stores and their deliverymen are driving all around town on the Kentucky Fried Chicken® mopeds. At Christmastime, KFC Japan even sells 1% alcohol bottles of “Christmas champagne”.